Everyone hates shaky videos, don’t you agree? I was always getting annoyed when visiting gorgeous places, as my videos looked terrible. But I’m also usually one of the last person to buy new gear, as I don’t like spending a ton of money on expensive products. This is why I went for the DJI Osmo Mobile. 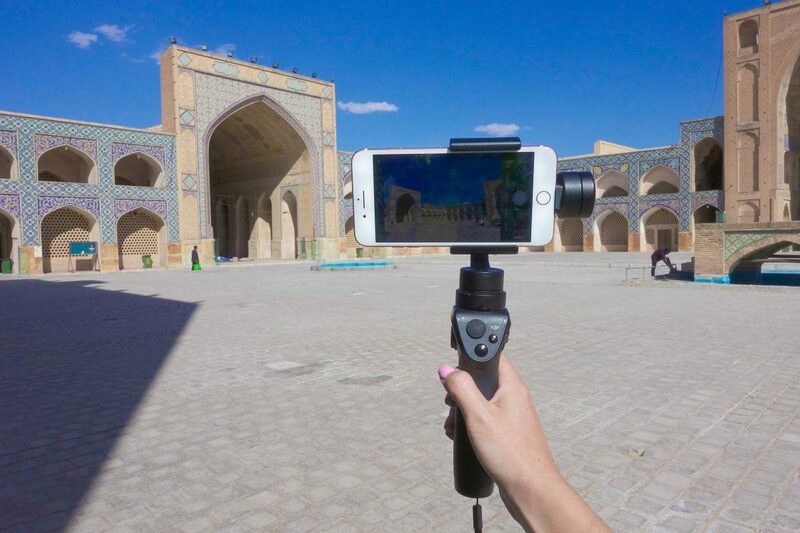 DJI Osmo is a three-axis motorized gimbal with an adjustable phone mount. The gimbal uses its motors to counteract any shake or movement. Why? To keep all your shots steady. Whether you’re standing still, running, or riding in a car. The stabilization alone doesn’t make the device stand out. DJI Go App is the big advantage of this device is the app that gives you full control over the camera and a couple extras to take advantage of the stabilizer. There are 3 modes: panorama, long exposure, and time-lapse. You can also use an ActiveTrack, a feature borrowed from DJI’s drones, that can allow you to film people easier. * Evo Gimbal is also a good gimbal. It’s slightly lighter, feels more metal than plastic, and could be used with a GoPro or chest strap. I had a chance to try it out and I was satisfied with the results. However, I’d rather use a DJI product due to the improvements with the app. Battery life: up to 4,5 hours. If it’s not enough for you, get a spare one for just $23. Price. It’s just $289 on Amazon! Videos look way more professional. Easy way of recording timelapse with Motion Timelapse function. The camera moves on it’s own (see an example of the sea waves in my video). If you want to get a tripod for it, I recommend the extension rod that can extend into a small tripod. It’s extremely light – it weighs only 499 g.
Osmo is very easy to use. I personally hate reading instructions, but I quickly figured out how everything works. When traveling around Oman the device went crazy for a day. I had to restart it million times and even re-install the app. Eventually, it fixed itself. It wasn’t a big deal . . . just something I had to do once in a while. If you’re planning on using it for vertical shots (eg. Instagram stories) then it’s probably not for you. Until the app is updated, constant flipping. Can you use DJI Osmo Mobile with iPhone 7 Plus? The device isn’t ideal for iPhone 7 Plus just yet. You can’t keep absolutely any case on your phone (even with this thin plastic case I have), as it makes the device tilt. Some user report shaking, but personally, I haven’t encountered it yet. If you have any other iPhone older than 7 (without image stabilization) your Osmo will work better ironically. How to set up DJI Osmo Mobile? Some reviews will tell you that Osmo is ready to go out of the box with no additional setup. Well, that’s not 100% true, as it requires some setting up. You need to download the DJI app first, pair your device and fully charge it. Once your device is charged you can start playing with it. 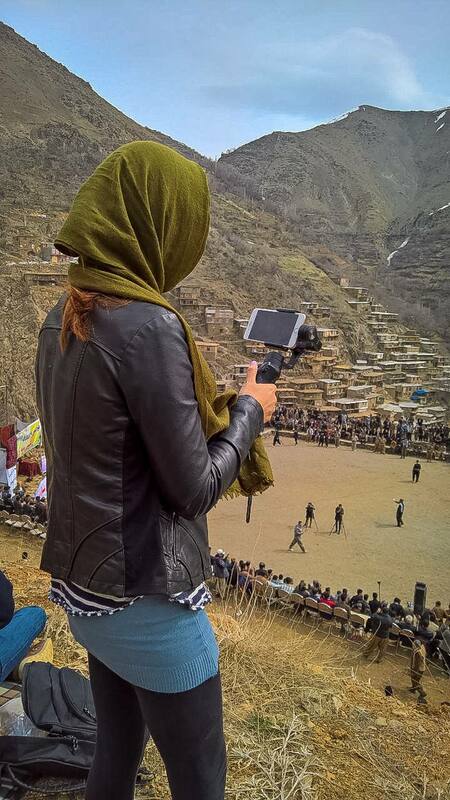 Remember that before you start filming important footage you should learn how to move it around. The footage might not be smooth until you learn how to use your gimbal. I suggest that unless you already have a DJI drone and know the app, use a regular video app first and see how your Osmo reacts. Once you learn how to move your Osmo you’ll be able to switch easier. Remember to always have your Bluetooth on, even if you’re shooting in a regular photo/video mode. If your Bluetooth isn’t on you’ll have to touch the screen every time to take a picture or start a video, instead of one simple click on your Osmo device. I’d definitely recommend the DJI Osmo Mobile if you’re into videos. The mobile version is significantly cheaper than the one with a built-in camera, and if your phone is newer the quality will be similar (unless you’re shooting for giant screens). You WILL stand out. People might stop you and stare, as they aren’t used to seeing gimbals. I got a lot of comments like ‘wow, that’s SOME selfie stick’ and I had to explain to them that it’s a gimbal, not a selfie machine. 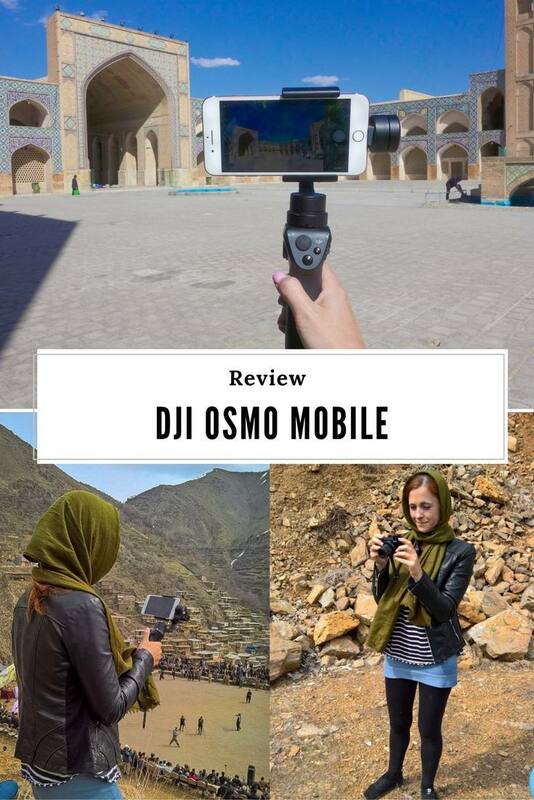 I think you should BUY DJI OSMO MOBILE. It’s worth it. Just be prepared to experience some additional calibration if you’re an owner of an iPhone 7 Plus. The score of this review could also improve in time if DJI updates the accompanying app so that it can capture 4K video.